Well, it is that time again. The markets are over for the year and the holidays are here. Instead of markets, Uneek can be seen out and about at local stores doing special event days. 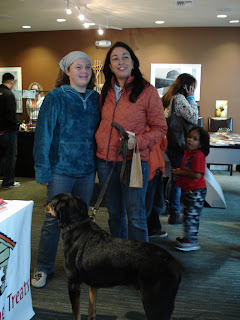 My Saturday started out at the 1st annual Urban Paws Event at the Marcato in Tacoma. 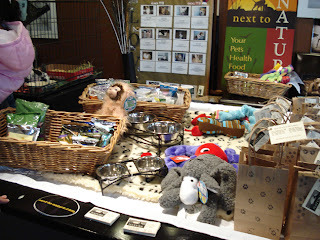 We met so many wonderful pups and their owners and the other great vendors that were there. Check out Levi, what a beauty. 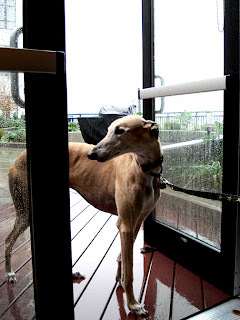 I was so lucky to get the Greyhound lean. 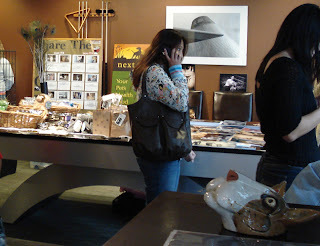 Next To Nature came to show their support and pass out grain free food for Cats and Dogs, treats and other fun items. 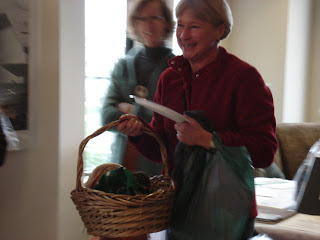 A happy winner of a donated basket for the benefit of the Tacoma Humane Society. See that great sculpture in the front of the image, get your best pal immortalized in their very own face sculpture. It is so fun! Winners of the Uneek Treats pack we donated! Thank you for bidding on our pack in the silent auction for your best pal. We LOVE the support! What a GREAT photographer. Brand new to the scene and a huge pit bull advocate. He knows so well, what we know to be true. It is the owner, not the dog on almost every occassion. 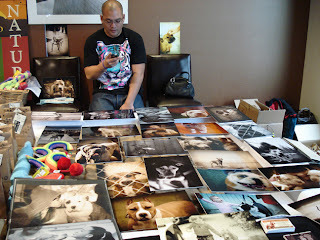 Please get involved with Ariel Payopay and kazuo Nakashima of the PITBULL FORUM. After the event, we packed the family into the Xterra and hit the road for Vancouver, BC. 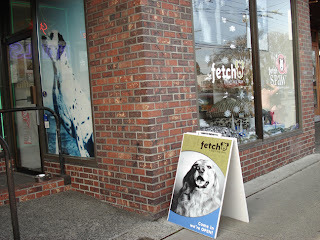 We decided to deliver to Fetch. We could not be more excited to have our treats there. What a great store! We always love it when we get there. Vancouver is amazing and just different enough from Seattle to keep us busy every time we go. What a great shot of Serch. Here he is waiting for Uneek Treats. 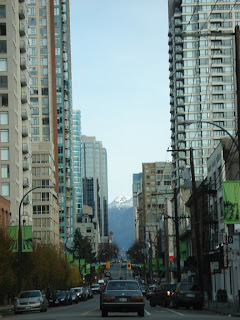 We stayed at the Opus Hotel in Yaletown. Talk about being pampered! They had water out for Serch and The Zappa. Special dog packs w/ treats and food and other essentials. I had a Modern Dog magazine (Canadian mag) and Pete got cupcakes for his birthday. How great! We have never stayed in such posh quarters. The room was the size of a postage stamp but since we didn't stay in the room very much, no matter. Serch and Zappa are ready to go and see the town. Let's go MOM and DAD! HURRY! Zappa did not like the elevator. Once we had to shove her in. Once it started moving she would squat until it stopped. I did not like that she was afraid but it was too funny! She finally got the hang of it on the last trip out. Serch and Zappa just wanted to get out and see the town. So that's what we did. Everyone loved them and they had the best time with all the new smells. I wonder if Canada smells any different to The Zappa? It was a quiet ride home with everyone sleeping. Rolling back into town Sunday early evening. 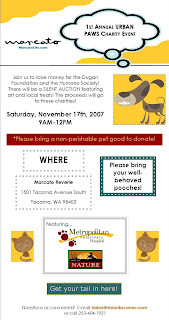 Look for me at the Metropolitan Market in Tacoma on Saturday, Dec 1st and later this month at Urban Dogs in Bellevue. 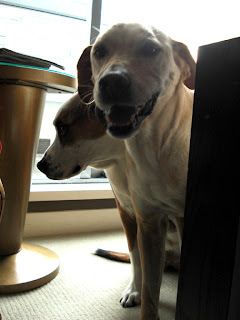 "BOGIE the Labrador Retriever & Hound Mix WILL DIE THIS COMING WEDNESDAY!!!!" THIS IS EXTREME URGENT !!!" My name is Bogie and I am a young energetic 8 month old Labrador Retriever & Hound Mix! Right now I am sitting in a shelter waiting for someone to claim me as their very own as I know I do not have much time left. I want to live and become YOUR dog !!! I am up to date with all my shots and will be neutered if I find a foster or forever home. 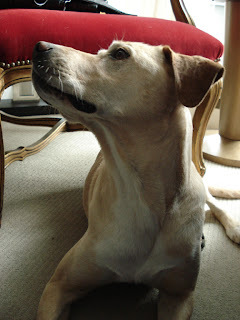 I get along great with people of all ages, I love to play with other dogs, kids over 7 because I am so full of energy. I am now 55 lbs, a happy dog, a total goofball and I am very trainable. I am a smart dog & would like to attend obedience school to learn how to do more commands and become a better dog. A fenced in yard is required and having another dog to play with would be great. THIS IS BEAUTY! 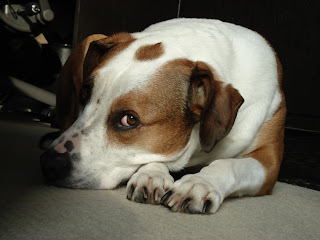 An English pointer/ Pit-bull mix. She is a year old, spayed, vaccinated and I am not sure if she is micro chipped. She is free, only to the perfect home that will love her for life. She is a dog I am fostering part time until she finds a home. She was taken from an abusive home where the male was very harsh with her and now she is a bit skittish around men. She is doing ok with Scott but still has some reserve. I think in time she will be great. She plays great with our two dogs but would love to have her way with our cat if you know what I mean. I don't know how she is around kids. She loves to cuddle on your lap or in bed with you. She is crate trained and now knows how to use a doggie door!! I took her to the lake for the first time yesterday and discovered she had never been near water. She ran into the lake at full speed and you could tell by the look on her face she was confused as to why the land was giving way under her feet! She stopped when she was up to her neck in the water and slowly turned around and came back to shore. After that she liked the water. She loves to play fetch! She has not had anyone in the one year of her life teach her any manners or to sit, stay, off ect... She will need someone patient and to give her some lessons. She doesn't bark much but she does have a little snore about her when she sleeps. Beauty luckily does not know her name very well since it was given to her by the Covington Veterinary Clinic back in August when they received her. We do not know what her name was before so they call her Beauty. I think anyone could easily change her name and that would be fine. I am working on finding Beauty the perfect home for her. I am taking her on weekends right now just to get her out of her kennel she has been cooped up in since August and to help her get some social skills. However, my other goal in taking her for the weekends it to get her exposure to anyone who may want to adopt her. If you know anyone or if you are interested in adopting her you can call me (Lisa) at my home (253-277-277-2959) or you can contact the Covington Veterinary Clinic at 253-631-8616. Thank you all for helping me find Beauty a great home!! 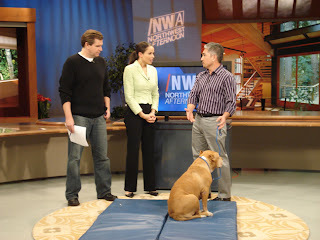 My friend Karleen invited me to go with her to be in the audience for the taping with Cesar Millan on Northwest Afternoon. 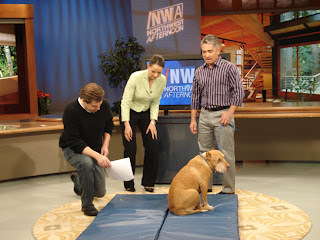 It was fun and his pitbull “Daddy” is a very sweet dog and a good “spokes dog” for pitbulls. We were able to give Cesar Uneek Treats too. We met Cesar on accident walking to the studio. We thought he was just some guy walking his dog to daycare then we realized it was him he shook our hands-funny moment. We were able to network the Towels for Shelter Drive and talk about the local rescues of course. 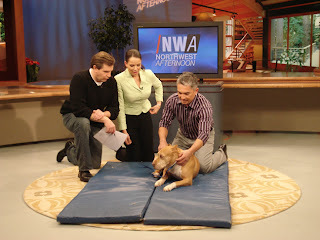 We also were invited to do a public announcement for the Towels For Shelters. If you have any old towels that you would like to donate for the local shelters spay and neuter program I would be happy to take them. This is a very “green” recycling program benefiting the earth, people and animals. Thanks Karleen for inviting me and giving me a chance to find out about the opportunity to share our shelter needs with our community through Public Service Announcements. All rescue operations should take the opportunity to do one. We will be able to spread the word. Get more involvement and decrease the overwhelmed shelters.